Update: The new checkout 51 offers have reset and now the Glade offers can’t be combined with coupons. This week at Walgreens, buy 4 participating SC Johnson products and get back a $4 Register Reward. 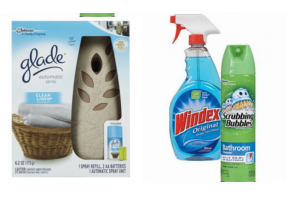 Score four products for as low as $0.24 Each. This scenario below has been updated. Its no longer FREE as of 6/23, but its still a great deal. If you don’t already have a free Checkout 51 account, CLICK HERE to sign up. New members who sign up before 6/29 and submit their first rebate by 7/20 will earn a $5 bonus. If you don’t currently have an Ibotta account, Sign UP HERE. New members get a $10 bonus when you redeem your first offer. How do you get both of the coupons to scan I tried it earlier and it wouldn’t let me do it. One has to be enter in manually.